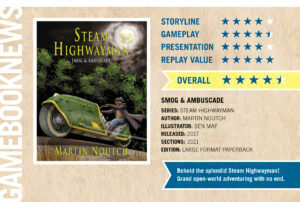 Steam Highwayman launched last night at 8pm and already, around 12 hrs later, it is nearly 50% funded! Great news. I’ve had some generous support from friends but also have managed to secure backing from gamebook fans and international backers. My Facebook page for the project is also steaming ahead: another 26 likes and I get to publish my account of the design process for the character of the highwayman. Can’t wait! I’ve had some great social media support from the gamebook community, so I’m still waiting to find out how far this will go. It’s going to be a great ride.